It’s time to craft together again! Join us Zesty ladies as we take time to sip and create. 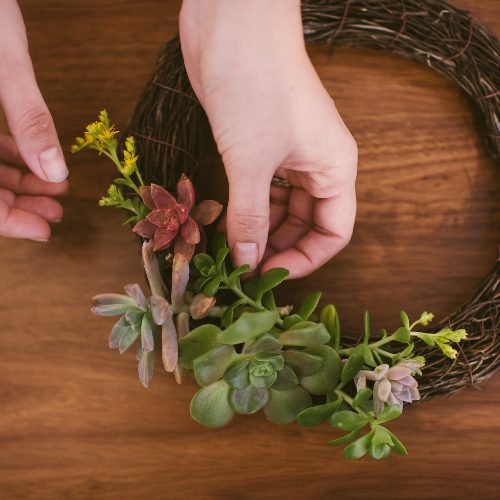 Working with grape vine wreaths and oodles of fabulous succulents, each attendee will take home a one-of-a-kind creation to welcome spring! To make our time even more enjoyable, lovely nibbles will be provided to keep us sated as we sip a selection of delightful Zaca Mesa wines during our art session. Come alone or as a group for an evening of fun! OR Grab your tickets at a 20% discount if you buy them as a package! Due to limited seating and high demand of workshop tickets, we have a 24 hour cancellation policy to receive a refund or to reschedule. We have a workshop minimum of at least 5 people. If we need to cancel the workshop we will notify the guests at least 3 hours in advance. Either a refund can be issued or credit can be kept on file to be used at a future workshop. Thank you for understanding!